We are delighted to invite you for a private viewing of CB1 on 19/08/18 between 6h30-8 at the Brick Lane Gallery, London. CSVPA Masters class of 2018 are proud to present CB1. CB1 is an exhibition running between 20/09/18 to 23/09/18 in the trendy Brick Lane district of London that brings committed work and research together to tempt the naked eye and astound the senses. CSVPA Master’s class of 2018 are a group of 8 students from all different walks of life. We reflect on the past and ask what it means for our future. 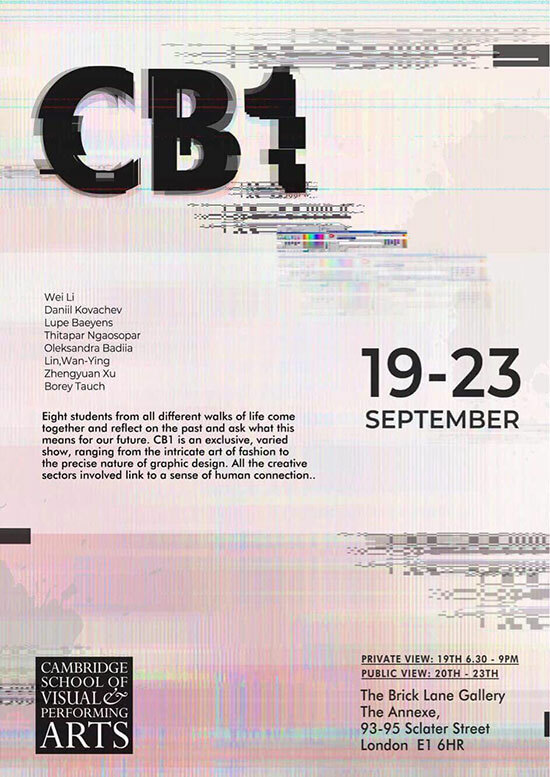 CB1 is an exclusive, varied show, ranging from the intricate art of Fashion to the precise nature of Graphic Design. The creative sectors involved link to a sense of human connection. Daniil is a seasoned fashion student who explores the days of yesteryear in the 90’s. Daniil absorbs inspiration from his roots and his upbringing for a collection that has been designed to pair with various different garments. The 90’s was a decade of change. The rise of female empowerment was upon us and there was a sense of liberation in the air. This is a Haut couture collection that embodies the significance of the decade, whilst showcasing excellent craftsmanship. Borey is also a fashion designer who has taken light from the study of moths. Moths are known for their natural beauty and delicate anatomy. This is portrayed in beautiful garments that have been given a modern twist. Borey has incorporated the use of new, cutting-edge technology in his SS19 collection to embody the powers of beauty and technology to produce his Haut couture collection. Inspired by emotional attachment to sentimental objects and the emotion of ‘loss’, Jewellery designer Judy has created a collection of intricate jewellery to embody these emotions upon the body that adorns these designs. Sasha is a talented graphic designer who has put together a social promo campaign to give us ‘Generation B’. ‘Generation B’ is a campaign that prides itself in raising awareness and prevents loneliness. Brought together in stunning graphic design, Sasha’s mission is to empower older people in Ukraine to age with security and dignity. This campaign has been tailored to inspire older people to participate within heir families and communities. With a successful background in fashion design and fashion branding, Fern has created her own branding project. Fern presents a new, modern way of identifying consumer perceptions by engaging and utilising all human senses in an effort to create a future brand environment. Fashion promotion student Lupe has mastered the art of seeing into the future. By presenting a dystopian view on the future of fashion, Lupe invites you all to take a trip with her in too the future of fashion and to be a part of her vision for the future. Paul is a photographer that has focused on the darker side of the spectrum. 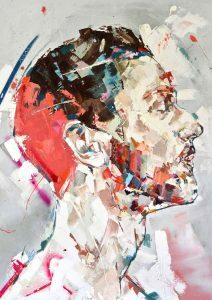 Incorporating the feelings and emotions of depression, Paul has helped for us too actually see the feeling in a haunting, hard-hitting collection of his work. Graphic designer James has taken the idea that we are fast becoming a world that relies upon looking good and feeling good. Because of this, he has constructed his own fitness app which takes a new, modern approach to the art of staying healthy. Visit The Brick Lane Gallery and enjoy the CSVPA MA Art + Design graduation show. Get involved with a critical design project, see the launch of a new fashion label and get your hands on the first issue of new fashion magazine VIII. The course, delivered in partnership with Hearst Magazines UK, is a diverse, unique and exciting Master’s, and the work show on show reflects this. The students work across contemporary Art + Design— fashion, editorial, photography, installation, interactive digital design and AI, experimental textiles and more.